Why did working men help create Shaker Heights? Why did working men help create Shaker Heights in 1911? Most signers of the petition that carved Shaker Village out of southern Cleveland Heights were working men who owned small homes near Cleveland. Why would they choose to be part of the new Shaker Village when the city of Cleveland offered well established schools and services that would better meet their needs. Why did they sign the petition? William Van Aken (1884-1950) knew the men who lived along Woodland (today Larchmere) Road. They were skilled workers and tradesmen. Most had been born in Central Europe. They lived in small homes, some in up-and-down duplexes. He had lived near them for years, was a bookkeeper in a foundry that employed some of them, and hoped to "plat" his mother's farm and sell plots to men like them. We can describe the neighborhood and its residents accurately as their homes still stand and we have their 1910 US Census data on these pages. 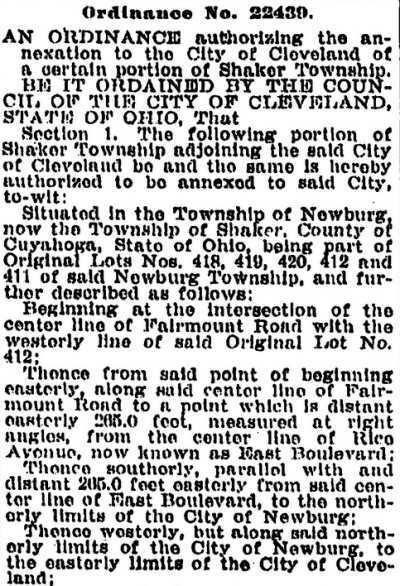 In early 1911 Van Aken circulated the petition that freehold electors (men who owned land and were registered voters) signed and by doing so led to the area's detachment from Cleveland Heights and the creation of Shaker Village. These petition-signers who lived in what was then southwest Cleveland Heights didn't share the Van Sweringen vision of a community for Cleveland's elite: large homes on large lots, Protestant churches, private schools and country clubs. Then why did they sign the petition? Our pages on the 1911 creation of Shaker Village and on the 1912 transfer of the Shaker Square area to the Shaker schools did not raise this question nor try to answer it. There is ample evidence to show that those we will call the westerners wanted to become Cleveland residents. Getting out of Cleveland Heights was the first step This page will try to explain. This 1910 Forman-Bassett-Hatch map shows the homes of the westerners. They are in the cluster of streets east of East Boulevard, north of Woodland Avenue. east of the city limits. Shaker Park, owned by Cleveland, includes the Shaker Lakes and is in Cleveland Heights. 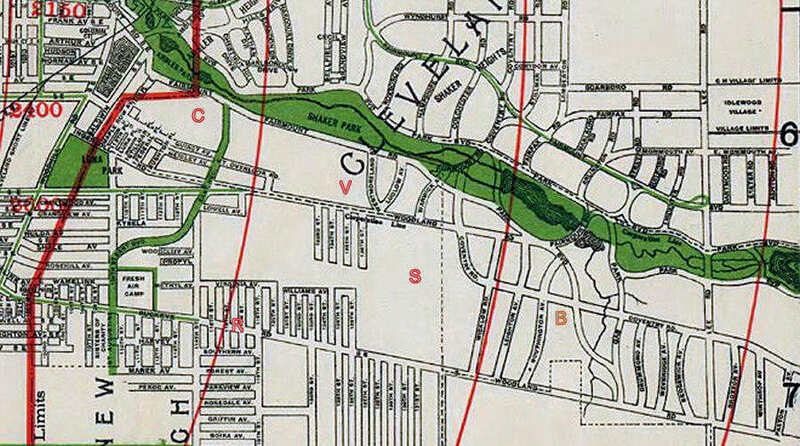 The ravine with Doan Creek became the legal separation between Cleveland Heights and Shaker Heights. In the left (west) Woodland Avenue is the southern border of Cleveland Heights. School size was important. Small schools had more than one grade in a classroom; larger schools had one or more classrooms for each grade. Cleveland Heights had just opened Roxboro Elementary, north of North Park Boulevard. It had only a few classrooms. Shaker had eight grades in three classrooms in a small building at Lee Road and Shaker Blvd. Cleveland's Rice Elementary on Buckeye and East 116th was the best choice. It is established, large and easy to get to. Further, most students are from families like theirs. Cleveland was strong and growing. Immigrants, most from Southern and Eastern Europe, and Americans leaving farms were coming in large numbers, most to its older neighborhoods. Much growth was due to annexations of adjacent villages because they recognized that the city could provide the infrastructure and services they needed. Cleveland's schools and libraries were very strong, leading some contiguous villages to arrange to send their children to them. Examples: Newburgh City and Glenville used Cleveland's schools years before their annexations. As Clevelanders moved up the economic ladder they would move to newer and better housing, That generally meant moving east or west of the city's core, a change facilitated by the growing network of streetcar lines. Cleveland's eastern limit kept moving east. In 1910 it was at East Boulevard. Woodland Avenue starts near downtown (in the background) and goes uphill to the Heights. The hill ends here at Martin Luther King Jr. Drive (then East Blvd. ), the city limit in 1910. Woodland continues east as Larchmere Boulevard. Searching a real estate website found this house on Mount Overlook Avenue. 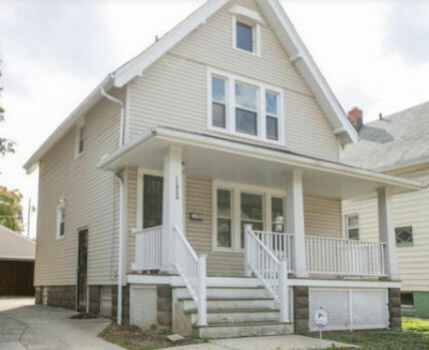 Built in 1910, it has three bedrooms and one bath. Its owner, if registered to vote, could have signed the 1911 petition to create Shaker Village. Our page on the creation of Shaker Village told of its separation from Cleveland Heights Village in June 1911. Four months later, in a referendum on October 27, 1911, Shaker Village became Shaker Heights Village, without its most western streets. Had the Van Sweringens acted unilaterally to leave behind the streets near Cleveland with their small homes, porches and two-family homes - all contrary to "Van" norms? 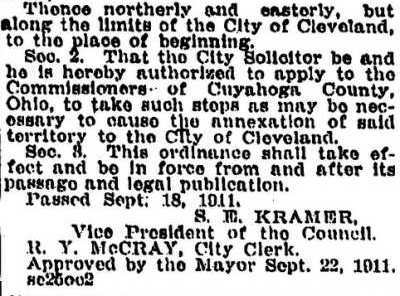 Then a legal notice (shown at the right) published in the September 25, 1911 Plain Dealer told a new story. 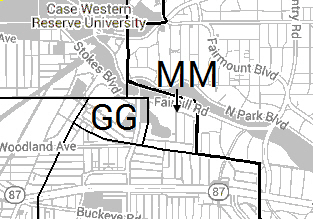 A petition started the annexation of the the most western of the western streets to Cleveland (GG on the map above). Its first signature is dated September 11, 1912, six weeks before Shaker Village had its referendum. We believe that the creation of Shaker Village was a cooperative effort between those in the eastern areas who wanted to create Shaker Village and those in the western streets whose aim was to become Clevelanders. There is one known interaction between the two groups, probably in July 1911, soon after the creation of Shaker Village. The Van group realized that the East 130th Street western limit it planned for the trimmed-down Shaker Heights Village would have left William Van Aken, who lived on East 128th, outside the new village and thus unable to serve on its city council. A friendly negotiation between the groups resulted in the border being shifted west to include the home of the widow Mary Van Aken, the residence of her only son, 26 year old William. William Van Aken, with the creation of Shaker Village and its reformation as Shaker Heights Village done, had more to do. Rice Elementary in Cleveland was being doubled in size. Knowing that his mother's land in Shaker Heights would be more valuable if children living there could attend that school, he began to work on an exchange of areas between the school districts of Cleveland and Shaker Heights. In the map at the right the areas marked GG and MM were the western part of Shaker Village that was not included when on October 27, 1911 Shaker Village voted to become Shaker Heights Village. For reasons not known two annexations were needed. The annexation of area MM began in June 1913 and was achieved on February 12, 1915. Our page How The West Was Lost documents those annexations. Shaker Heights incorporated by the State of Ohio. The Cleveland schools agree to add many Shaker streets north of Larchmere. In exchange Shaker's schools agree to take over the area where Shaker Square will be built. 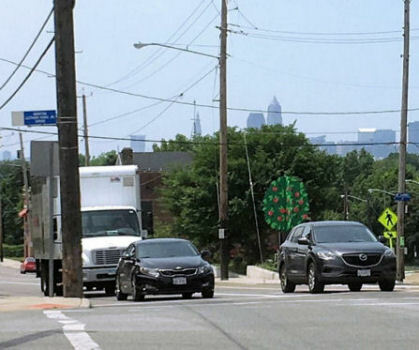 Cleveland annexes more western streets.